A peculiar review indeed. But perhaps not for the reasons you might think. 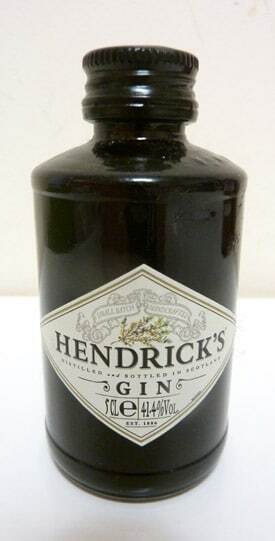 We’re taking an opportunity to take a look at an early favorite of the Gin is In’s: Hendrick’s Gin. Really the ultimate in gateway gins. But this time, we’re taking a look at the version of Hendrick’s UK that folks in overseas are used to seeing. You see, here in the states Hendrick’s is bottled at 44% or about 88 proof. but in the UK? a full 6 proof points lower. 41.4% or 82.8 proof. The nose is heavy on the rose, bright and floral. The taste though is smooth and slow at first, very easy to be drank. A hint of cucumber, then the other flavors in Hendrick’s UK accelerate and crash altogether, juniper and earthy angelica, hints of coriander. It fades, leaving a warm alcoholic burn taste in the back of your mouth and a bright hint of floral long after the initial taste. Strikingly easy to drink, even neat, but although it is not much of a difference in proof, my perceptions differ markedly where I’m noting that it is almost “watery and neutral” at first, and feels more drinkable than even Hendrick’s in my first review. To be honest, all these years after my first experience with Hendrick’s, at most bars it is the most accessible gin behind the counter and still to-this-day perhaps the most likely gateway for the non-gin drinker to realize what gin has to offer. Hendrick’s UK— alike it’s American 44% ABV sister— is a versatile mixer in all number of cocktails. At this point I’m not seeing much of a difference so I will refer you back to the other review for more a more thorough write up. In conclusion, if the goal of this review was to establish a difference between the UK version and the US Strength— I have to say there is pretty much none. Save a measly 2.9% ABV. They’re the same product. This is NOT a favourite. After mixing some Hendricks G&Ts at a party, I actually looked to see if I had picked up someone else's drink... one that might have had lipstick on the rim. Export strength gins should be around 47%. Sadly, the strength of many gins has been reduced in the UK (something to do with tax rates) so nowadays, some gins are only 37.5%. Consequently, you need to use more to achieve a decent gin and tonic. You may pay less tax, but you use a lot more.